Anne Pfuntner, Lauren M. Wier, M.P.H., and Anne Elixhauser, Ph.D. The overview of 2010 data was published in Statistical Brief #144, Overview of Hospital Stays in the United States, 2010.2 The present Statistical Brief provides 2011 data on characteristics of stays in community hospitals in the United States and compares the results to data from previous years. Statistics also are included for stays by primary payer, age, discharge status, and community income. All differences between estimates noted in the text are statistically significant at the .001 level or better. Table 1 shows characteristics of stays in U.S. community hospitals in 1997, 2010, and 2011. There were 38.6 million hospital stays in 2011, which is an 11 percent increase since 1997; however, the hospitalization rate remained stable during this period (about 1,240-1,270 stays per 10,000 population). The national distribution of stays by hospital location, teaching status, and ownership remained unchanged between 1997 and 2011. In 2011, most stays (87 percent) occurred in metropolitan hospitals, nearly half of stays occurred in teaching hospitals, and about three quarters of stays were in private, not-for-profit hospitals. The charge per stay is the amount that hospitals bill to patients for their rooms, nursing care, diagnostic tests, procedures, and other services. Mean charges per stay more than doubled since 1997 to $35,400 in 2011 (inflation adjusted). The cost per stay is the amount of the hospital's actual expenses incurred for producing services. Mean costs per stay in 2011 were $10,000, which represents a 47 percent increase since 1997 (inflation adjusted). Aggregate hospital costs were $387.3 billion in 2011; this was a 63 percent increase since 1997 (inflation adjusted). There were 38.6 million hospital stays in 2011, which is an 11 percent increase since 1997; however, the population also grew during this period, so the hospitalization rate remained stable at about 1,200 stays per 10,000 population. Aggregate hospital costs were $387.3 billion in 2011—a 63 percent increase since 1997 (inflation adjusted). Costs per stay increased 47 percent since 1997, averaging $10,000 in 2011. In 2011, 60 percent of stays were billed to Medicare and Medicaid—up from 52 percent in 1997. Between 1997 and 2011, the share of stays billed to private insurance fell from 39 percent to 32 percent. Patients from the lowest income area had a higher hospitalization rate (1,401 stays per 10,000 population) than patients from all other income areas (1,155 stays per 10,000 population). The hospitalization rate was similar for patients living in the Northeast, Midwest, and South (about 1,300 stays per 10,000 population). Patients living in the West had the lowest hospitalization rate, at 1,029 stays per 10,000 population. 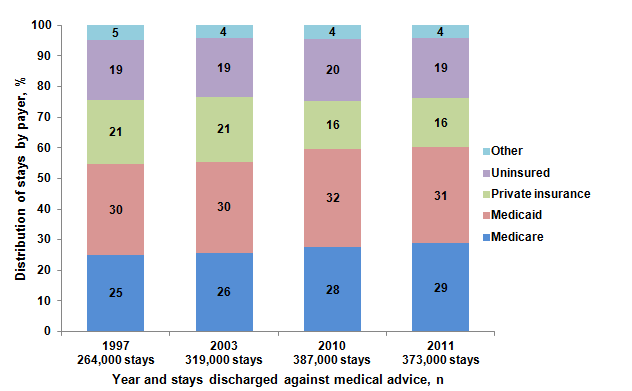 The total number of stays discharged against medical advice increased 41 percent between 1997 and 2011. The share of discharges against medical advice by adults aged 45-64 years increased from 27 percent in 1997 to 41 percent in 2011. From 1997 to 2011, the share of discharges against medical advice increased from 25 percent to 29 percent for Medicare and decreased from 21 percent to 16 percent for private insurance. The uninsured accounted for 7 percent of stays for patients from the lowest income communities and 5 percent of stays for patients from all other communities. * Charges per stay, costs per stay, and aggregate costs are inflation-adjusted to 2011 dollars. In 2011, more than half of stays (60 percent) were billed to government payers Medicare and Medicaid (Figure 1). The percentage of stays billed to Medicare and Medicaid increased between 1997 and 2011: from 36 percent to 40 percent for Medicare and from 16 percent to 20 percent for Medicaid. The percentage of stays billed to private insurance, however, decreased during this period from 39 percent to 32 percent. The share of uninsured stays and stays billed to other payers remained stable between 1997 and 2011 at about 5 percent and 3 percent of stays, respectively. Note: Excludes a small number of stays with missing payer. Figure 1. Number and distribution of hospital stays by expected primary payer, 1997Â¬-2011. This is a stacked bar chart showing the number of stays in millions in percent by year. 1997 - total 34.7 million: Medicare, 36%; Medicaid, 16%; Private insurance, 39%; Uninsured, 5%; Other, 4%. 2003 - total 38.2 million: Medicare, 37%; Medicaid, 18%; Private insurance, 37%; Uninsured, 5%; Other, 3%. 2010 - total 39.0 million: Medicare, 37%; Medicaid, 21%; Private insurance, 32%; Uninsured, 6%; Other, 3%. 2011 - total 38.6 million: Medicare, 40%; Medicaid, 20%; Private insurance, 32%; Uninsured, 5%; Other, 3%. Note: Excludes a small number of stays with missing payer. Source: Agency for Healthcare Research and Quality (AHRQ), Center for Delivery, Organization, and Markets, Healthcare Cost and Utilization Project (HCUP), Nationwide Inpatient Sample (NIS), 1997, 2003, 2010, and 2011. Table 2 shows characteristics of patients who were hospitalized in 2011. With the exception of infants, hospitalization rates increased with age. The high hospitalization rate for infants (10,665 hospital stays per 10,000 population) was largely due to births occurring in the hospital in addition to those infants who required additional hospitalization after birth. Females accounted for 58 percent of hospital stays in 2011; the hospitalization rate for females was also higher than for males (1,411 versus 1,056 stays per 10,000 population). About 30 percent of patients in 2011 were from low-income areas. The hospitalization rate for patients from the lowest income area (1,401 stays per 10,000 population) was higher than for patients from higher income areas (1,155 stays per 10,000 population). Patients residing in large central metropolitan areas accounted for nearly one-third of hospital stays in 2011. Patients from rural areas accounted for the smallest share of stays (18 percent). The hospitalization rate for patients from rural areas was 28 percent higher than for patients living in medium and small metropolitan areas (1,377 stays versus 1,074 stays per 10,000 population). The hospitalization rate was similar for patients living in the Northeast, Midwest, and South (approximately 1,300 stays per 10,000 population). Patients living in the West had lower hospitalization rates than all other regions, at 1,029 stays per 10,000 population. The number of hospital stays discharged against medical advice increased 41 percent between 1997 and 2011 (from 264,000 to 373,000 stays) (Figure 2). Adults aged 18-44 years accounted for 56 percent of stays discharged against medical advice in 1997 and 44 percent in 2011. The share of discharges against medical advice for adults aged 45-64 years increased from 27 percent in 1997 to 41 percent in 2011. Adults aged 65-84 years accounted for 12-13 percent of shares in both years. The youngest and oldest age groups—children aged 17 years and younger and adults aged 85 years and older—accounted for 2 percent or less of stays discharged against medical advice in 1997 and 2011. * Data for children younger than 1 year were suppressed in 2003. Note: Excludes a small number of stays with missing age. Note: Bar segments representing 2 percent or less are not labeled. Figure 2. 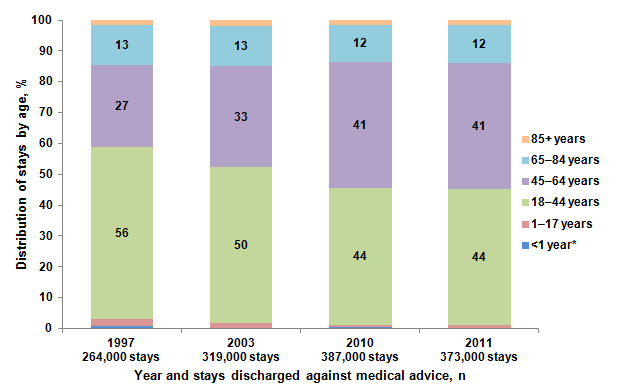 Distribution of hospital stays discharged against medical advice by patient age, 1997-2011. This is a stacked bar chart showing the distribution of stays by age in percent by year and stays discharged against medical advice. 1997 - 264,000 stays: Less than 1 year, 2 percent or less; 1 to 17 years, 2 percent or less; 18 to 44 years, 56%; 45 to 64 years, 27%; 65 to 84 years, 13%; 85 years and older, 2 percent or less. 2003 - 319,000 stays; Data for children younger than 1 year were suppressed in 2003: Less than 1 year, 2 percent or less; 1 to 17 years, 2 percent or less; 18 to 44 years, 50%; 45 to 64 years, 33%; 65 to 84 years, 13%; 85 years and older, 2 percent or less. 2010 - 387,000 stays: Less than 1 year, 2 percent or less; 1 to 17 years, 2 percent or less; 18 to 44 years, 44%; 45 to 64 years, 41%; 65 to 84 years, 12%; 85 years and older, 2 percent or less. 2011 - 373,000 stays: Less than 1 year, 2 percent or less; 1 to 17 years, 2 percent or less; 18 to 44 years, 44%; 45 to 64 years, 41%; 65 to 84 years, 12%; 85 years and older, 2 percent or less. Note: Excludes a small number of stays with missing age. Source: Agency for Healthcare Research and Quality (AHRQ), Center for Delivery, Organization, and Markets, Healthcare Cost and Utilization Project (HCUP), Nationwide Inpatient Sample (NIS), 1997, 2003, 2010, and 2011. Figure 3 shows the distribution of hospital stays discharged against medical advice by primary payer between 1997 and 2011. From 1997 to 2011, the proportion of discharges against medical advice increased for stays billed to Medicare, from 25 percent to 29 percent, and decreased for stays billed to private insurance, from 21 percent to 16 percent. The share of discharges against medical advice was stable from 1997 to 2011 for stays billed to Medicaid (30-31 percent), the uninsured (19-20 percent), and other payers (4-5 percent). Figure 3. 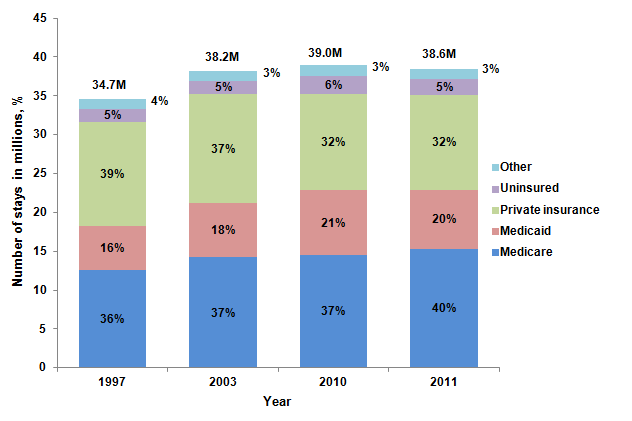 Distribution of hospital stays discharged against medical advice by primary payer, 1997-2011. This is a stacked bar chart showing the distribution of stays by payer in percent by year and stays discharged against medical advice. 1997 - 264,000 stays: Medicare, 25%; Medicaid, 30%; Private Insurance, 21%; Uninsured, 19%; Other, 5%. 2003 - 319,000 stays: Medicare, 26%; Medicaid, 30%; Private Insurance, 21%; Uninsured, 19%; Other, 4%. 2010 - 387,000 stays: Medicare, 28%; Medicaid, 32%; Private Insurance, 16%; Uninsured, 20%; Other, 4%. 2011 - 373,000 stays: Medicare, 29%; Medicaid, 31%; Private Insurance, 16%; Uninsured, 19%; Other, 4%. Note: Excludes a small number of stays with missing payer. Source: Agency for Healthcare Research and Quality (AHRQ), Center for Delivery, Organization, and Markets, Healthcare Cost and Utilization Project (HCUP), Nationwide Inpatient Sample (NIS), 1997, 2003, 2010, and 2011. Figure 4 shows the distribution of stays by primary payer for patients from all communities (all stays); low-income communities, which were defined as a median household income under $39,000 in 2011; and communities with incomes of $39,000 and higher in 2011. The share of stays was similar for patients across community income levels for Medicare (40-41 percent of stays) and other payers (3 percent of stays). The uninsured accounted for 7 percent of stays for patients from the low-income communities and 5 percent of stays for patients who were from higher income communities. Medicaid, which accounted for 20 percent of all stays, was the primary payer in 28 percent of stays for patients from low-income communities and 16 percent of stays for patients from higher income communities. Private insurance accounted for 22 percent of stays for patients from low-income communities, but it accounted for 32 percent of all stays and 36 percent of stays for patients who were from higher income communities. * Low-income communities are ZIP Codes with a median household income between $1 and $38,999 in 2011. Note: Excludes a small number of stays with missing payer or income. Figure 4. Distribution of primary payers for all hospital stays, stays for patients in low-income communities, and stays for patients in all other communities, 2011. This is a stacked bar chart showing the distribution of stays by payer in percent by median community-level income. All Stays: Medicare, 40%; Medicaid, 20%; Private Insurance, 32%; Uninsured, 5%; Other, 3%. Low Income (ZIP Codes with a median household income between $1 and $38,999 in 2011): Medicare, 41%; Medicaid, 28%; Private Insurance, 22%; Uninsured, 7%; Other, 3%. Higher Income: Medicare, 40%; Medicaid, 16%; Private Insurance, 36%; Uninsured, 5%; Other, 3%. Note: Excludes a small number of stays with missing payer or income.Source: Agency for Healthcare Research and Quality (AHRQ), Center for Delivery, Organization, and Markets, Healthcare Cost and Utilization Project (HCUP), Nationwide Inpatient Sample (NIS), 2011. Total hospital charges were converted to costs using HCUP Cost-to-Charge Ratios based on hospital accounting reports from the Centers for Medicare & Medicaid Services (CMS).5 Costs will reflect the actual expenses incurred in the production of hospital services, such as wages, supplies, and utility costs; charges represent the amount a hospital billed for the case. For each hospital, a hospital-wide cost-to-charge ratio is used. Hospital charges reflect the amount the hospital billed for the entire hospital stay and do not include professional (physician) fees. For the purposes of this Statistical Brief, costs and charges are reported to the nearest hundred. The classification of whether a hospital is in a metropolitan area ("urban") or nonmetropolitan area ("rural") is defined from the American Hospital Association (AHA) Annual Survey, using the 1993 U.S. Office of Management and Budget definition. Median community-level income is the median household income of the patient's ZIP Code of residence. The cut-offs for the quartile designation are determined using ZIP Code demographic data obtained from the Nielsen Company. The income quartile is missing for homeless and foreign patients. In 2011, low-income communities (the lowest quartile) are defined as having a median household income between $1 and $38,999. Introduction to the HCUP Nationwide Inpatient Sample, 2011. Online. June 2013. U.S. Agency for Healthcare Research and Quality. https://www.hcup-us.ahrq.gov/db/nation/nis/NIS_Introduction_2011.pdf. Accessed October 16, 2013. Houchens RL, Elixhauser A. Using the HCUP Nationwide Inpatient Sample to Estimate Trends. (Updated for 1988-2004). HCUP Methods Series Report #2006-05. August 18, 2006. Rockville, MD: U.S. Agency for Healthcare Research and Quality http://www.hcup-us.ahrq.gov/reports/methods/2006_05_NISTrendsReport_1988-2004.pdf. Accessed October 16, 2013. Pfuntner A (Truven Health Analytics), Wier LM (Truven Health Analytics), Elixhauser A (AHRQ). Overview of Hospital Stays in the United States, 2011. HCUP Statistical Brief #166. November 2013. Agency for Healthcare Research and Quality, Rockville, MD. http://www.hcup-us.ahrq.gov/reports/statbriefs/sb166.pdf. 1 HCUP Facts and Figures. Healthcare Cost and Utilization Project (HCUP). June 2013. Rockville, MD: Agency for Healthcare Research and Quality. http://www.hcup-us.ahrq.gov/reports/factsandfigures.jsp. Accessed November 4, 2013. 2 Pfuntner A, Wier LM, Elixhauser, A. Overview of Hospital Stays in the United States, 2010. HCUP Statistical Brief #144. December 2012. Agency for Healthcare Research and Quality, Rockville, MD. http://www.hcup-us.ahrq.gov/reports/statbriefs/sb144.pdf. Accessed November 4, 2013. 3 Agency for Healthcare Research and Quality. HCUPnet web site. http://hcupnet.ahrq.gov/. Accessed November 4, 2013. 4 Barrett M, Lopez-Gonzalez L, Coffey R, Levit K. Population Denominator Data for use with the HCUP Databases (Updated with 2012 Population data). HCUP Methods Series Report #2013-01. March 8, 2013. Rockville, MD: U.S. Agency for Healthcare Research and Quality. http://www.hcup-us.ahrq.gov/reports/methods/2013_01.pdf. Accessed November 4, 2013. 5 HCUP Cost-to-Charge Ratio Files (CCR). Healthcare Cost and Utilization Project (HCUP). 2001-2009. Rockville, MD: U.S. Agency for Healthcare Research and Quality. Updated August 2013. http://www.hcup-us.ahrq.gov/db/state/costtocharge.jsp. Accessed November 4, 2013. Internet Citation: Statistical Brief #166. Healthcare Cost and Utilization Project (HCUP). November 2013. Agency for Healthcare Research and Quality, Rockville, MD. www.hcup-us.ahrq.gov/reports/statbriefs/sb166.jsp.